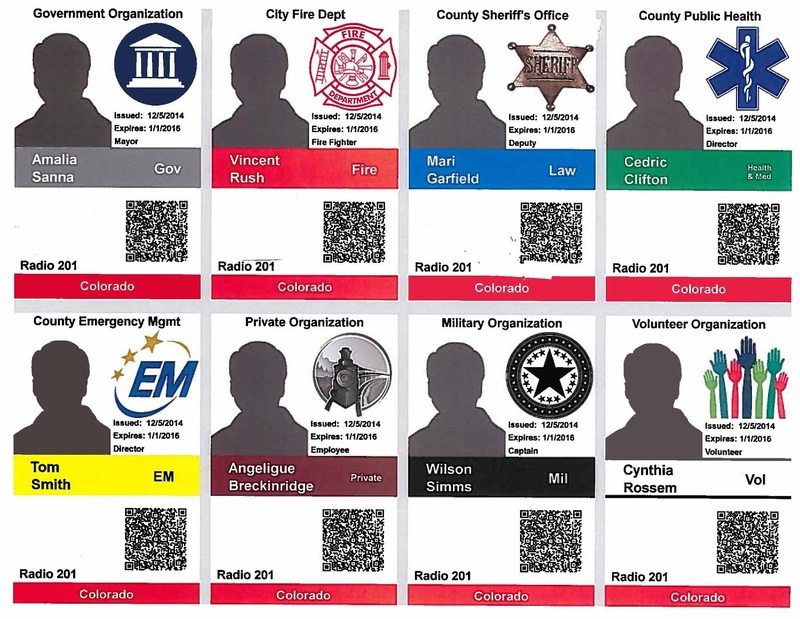 CDPS is in the process of rolling out new ID badges that offer a variety of benefits, including better integration with partner agencies and quicker access to critical information during emergencies. The ID badges can be printed on existing building access cards, eliminating the need for separate access cards and ID badges. If you use an access card to enter your building, you will only need one badge for both your ID and your access card! Your ID will mirror the look of most emergency responders working the incident and will work with their staff check-in, identification and tracking system. You will be able to more quickly check in and out by simply scanning your badge at a check-in point. DHSEM will be better able to track the use of CDPS resources on emergency responses and recoup the associated cost of deploying staff. Whether deployed to an incident or on the job at a state facility, you will have emergency contact information and other vital data handy and accessible on your badge; the people responding to help you will be able to scan the badge to quickly retrieve this data. The badges are easy to read and recognize, making it easier for all staff to quickly identify an employee’s role and level of access. Incident management/staffing can quickly verify your position and qualifications when you check in to work an incident. If something happens to you while you are on the job or working an incident, staff on site can scan the badge to quickly look up emergency contact information and other critical data. Partner agencies who use the system will be able to track your time on their incident and provide CDPS with more accurate data so that we can track and recoup our contribution. Is my information secure? Yes. The data you are providing is being captured in a secure database managed by DHSEM. They will then enter the data into the secure “Salamander” database, which can only be accessed by authorized users. When someone scans your new ID badge, they must have authorized access to the Salamander database in order to see the data encrypted on your badge. What if I lose my badge? Please notify a supervisor immediately so that CDPS can de-activate the old badge and issue you a new one. The information coded on your badge can only be read by those with authorization from the Salamander system. When will I receive my new badge? We anticipate rolling out the credentialing system before the end of the summer. Your staff liaison will notify you when they are ready to print your badge and what steps to follow to receive your new badge. For questions or more information, contact Adrienne Loye in the EDO's office.